On Monday, April 9th, we closed the website for ordering more bare-rooted trees for Spring of 2018. We will reopen the site to ordering bare-rooted trees for spring of 2019 when we know what and how many trees will be available for spring of 2019. We shipped all orders of bare-rooted trees today and Tom is packing orders that will be picked up from the farm. If you have an order of bare-rooted trees for local pickup, give us a call or email to schedule your pickup time. 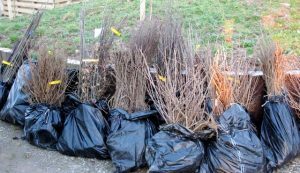 Bags of bare root trees.